Plus tips and supplies for fellow letterpress printers. 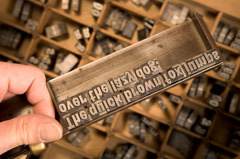 Letterpress was the every-day printing technique for five centuries, until offset lithography took over. In very simple terms, ink is applied to the surface of metal type (which has a raised surface with a reverse image, like a rubber stamp) and the type is pressed against paper to make an ‘impression’. The finished article has a tactile quality, with a thick layer of ink and a slight indentation where the type pressed against the paper. Images are reproduced in a similar way, using blocks of wood, metal, lino or nylon. It's still used commercially for things like high-class business cards, fancy wedding invitations, homely Farmers' Market jam jar labels... and there are fine art private presses who publish limited edition books for collectors. Letterpress is making a come back in colleges and there's a large band of letterpress enthusiasts to be found, worldwide, printing just for the love of it. Letterpress printing is extremely time consuming and labour intensive and in an age of lithography and digital printing it might seem like wasted effort. It isn't an alternative to modern, commercial printing techniques but it retains its place as a craft ideally suited to producing beautiful things in small quantities. An incredible amount of skill is required to print to a reasonable standard. 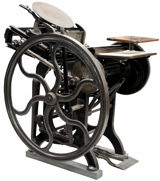 When letterpress was the main player in commercial printing, there were specialists who lined up the type (compositors) and there were the machine room staff who operated the presses. An apprenticeship took 6 years. These days letterpress is usually done by one person working alone and they will have had to learn all the disciplines involved. There aren't as many oppertunities for Joe and Joanna public to discover letterpress now that most of the printing museums have closed, but many of those who stumble upon letterpress are inspired to try it themselves. The current resurgence of interest is lead largely by young people who've discovered letterpress whilst studying art or design. It's no longer just retired printers who keep an Adana in the garage; students and designers are taking up the reins and the influence of the craft can be seen everywhere, perhaps most notably in the wave of new ‘display’ typefaces (those are the decorative ones you see in larger sizes) inspired by woodletter and fancy founts from the halcyon days of letterpress. If you'd like to know more about the mechanics of letterpress try How Does it Work?, a section aimed at explaining the fundamentals without blinding you with science! If you're looking to take up letterpress, try Getting Started for practical advice.